Stan Douglas has been named the recipient of the prestigious Infinity Award for Art by the International Center of Photography. Tonight, he will be presented the award at a ceremony in New York City. Douglas works in various media including video, installation and photography. Here, Lightbox visits highlights of three projects from the artist’s prolific photographic endeavors. What is real? What is unreal? In a world where reality and history can be recreated and manipulated to appear authentic in a photograph, it is imperative that we ask these questions. We, as a society inundated with visual culture, are trained to ponder the truth and meaning behind what we see—but what if a photograph was created to question reality? To question history? Stan Douglas creates images that catalyze critical analysis and force their viewers to revisit the scenes they depict. Douglas, in creating new images of scenes in history, ponders the truth within the medium of photography and the sociological issues that lie in the passages and stories illustrated in his photographs. Based in Vancouver, Canada, Douglas approaches each image with epic, Hollywood-level production—tapping into his history as a maker of films and video. Demanding the most active viewer who questions, challenges and investigates all that he or she sees, each image is created to excruciating detail. A production photograph depicting the lighting and building of the set of Abbott & Cordova, 7 August 1971, 2008. A 3-dimentional rendering Abbott & Cordova, 7 August 1971, 2008. In producing Abbott & Cordova, 7 August 1971, 2008 (slide #4), Douglas built a set to recreate a scene of the actual intersection in Vancouver. The placement of the actors in the image was pre-envisioned in three-dimensional renderings to anticipate the actual photograph. Not one detail was left unnoticed—down to the products in the dressings of the windows and the scraps of paper that lie on the streets. The mural-sized image, which was composited from 50 different images from the same shoot, is one of four in his series Crowds & Riots. All the images in the series are large scale tableaux depicting vignettes from Vancouver’s history—reflecting on matters of the police, class and social order. In his series, Midcentury Studio, Douglas took on the identity of a photojournalist working between 1945 to 1951 (a selection of this work is represented by slides #6 – #9 in the gallery above). Inspired by imagery from this time, Douglas created images that discuss the decisive moment in photography—as Henri Cartier-Bresson explained, the exact moment that the photographer makes the photograph by firing the shutter of the camera—that very moment which is creative. Unfolding on Cartier-Bresson’s expression, Douglas constructed and carefully created these scenes to capture this experience and illustrate the scrupulous amount of information and action that lies in each frame of a photograph. In Dancer II, 1950, 2010, Douglas created an image similar to one from our own archive shot by famed photographer Gjon Mili for LIFE Magazine. In Douglas’s most recent series, Disco Angola, most recently shown at David Zwirner Gallery in New York City in April, he once again approaches the identity of a photojournalist. This time, he is one who travels between New York City and Angola in the 1970s. Each image in the series utilizes the nature of body language as insight into the historical moment—from the pensive waiting of the Portugese colonialist awaiting evcuation (Exodus, 1975, 2012), to the interracial-intercultural array of dancing people (Club Versailles, 1974, 2012), to the group of rebel fighters performing capoeira, the Brazilian martial art that originated in Angola (Capoeira, 1974, 2012). Disco, a source of escapism for New Yorkers from the nearly bankrupt city at the time, traces its roots to Africa. Connecting these two seemingly disparate places, separated by thousands of miles of ocean and cultural-political borders, Douglas traces subtle parallels between New York’s struggles and the emerging Angolan liberation fight for independence from Portugal—one which would ultimately lead to a decades-long civil war. Douglas’s series Midcentury Studio is currently on view at Victoria Miro Gallery in London through May 26, 2012. More information about the Infinity Awards can be found here. This entry was posted in Canada, Contemporary Photography and tagged Abbott, Amp, Contemporary Photography, Critical Analysis, David Zwirner, Excruciating Detail, Gjon Mili, Henri Cartier Bresson, Icp, Infinity, International Center Of Photography, Intersection, Lighting And Building, New Images, New York, New York City, Passages, Photographer, Photographers, Photographic Endeavors, Photographs, Photography., Production Photograph, Profile, Question History, Recipient, Renderings, Sociological Issues, Stan Douglas, Vancouver, Vancouver Canada, Victoria Miro, Video Installation, Visual Culture on May 2, 2012 by Alexander Ho. We’d like to thank everyone who came out to the opening reception for Our Origins last Thursday! Jennifer Ray discusses the inspiration behind her series, Go Deep into the Woods. Alison Carey discusses her series, Organic Remains of a Former World with visitors. After giving a lecture on his video installation, The Most Important Picture Ever, Ken Fandell mingles during the reception. Jennifer Ray fields questions on her work during the opening reception. The crowd snacks and socializes, no doubt making plans to meet up at the next MoCP event. •	Thursday, September 27 at 5 p.m. when Colleen Plumb and Kelli Connell visit the museum to sign their books, Animals are Outside Today and Double Life. •	Tuesday, October 2 when Our Origins artist Aspen Mays joins Kathryn Schaffer, postdoctoral fellow at the Kavli Institute for Cosmological Physics at the University of Chicago, to talk about ways scientists and photographers can team up to help answer questions about the origins of the universe. This entry was posted in Contemporary Photography, Uncategorized and tagged Alison Carey, Artistic Representations, Aspen, Colleen, Connell, Contemporary Photography, Cosmological Physics, Curators, Jennifer Ray, Kathryn Schaffer, Kavli Institute, Kelli, Last Thursday, Mays, Mocp, No Doubt, Origins Of The Universe, Photographer, Photographers, Photographs, Photography., Postdoctoral Fellow, Tuesday October, University Of Chicago, Video Installation on September 15, 2011 by Audrey. The Wellcome Collection’s new show is all about ‘Dirt: The filthy reality of everyday life’, writes Rosie Walters. The science, the sociology, the history and the horror of waste forms the basis of this free London exhibition. It is not based on the science of dirt, but on the context in which it is found, and our attitudes towards it over the years. The Wellcome has a history of putting on exhibitions that blur the lines where science, communication and art all meet, and making it accessible not just to scientists, but to anyone who’s interested. Loosely split into six different sections, the exhibition guides you from the microscopes of Antonie van Leeuwenhoek (below) and immaculate houses in seventeenth-century Delft, to the squalid reality of life in the slums of New Delhi and the growing crisis of waste disposal in New York’s Staten Island (above). 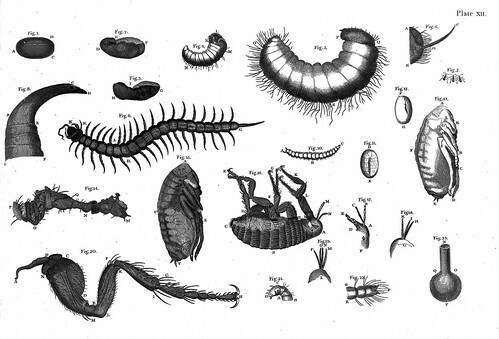 Above: Ant eggs and maggots etc., by Anthony van Leeuwenhoek, 1807. Courtesy Wellcome Library, London. Each section explores social and political attitudes to the many different types of dirt. From human to industrial, it seeks to examine anthropologist Mary Douglas’ view that dirt is just ‘matter out of place’. 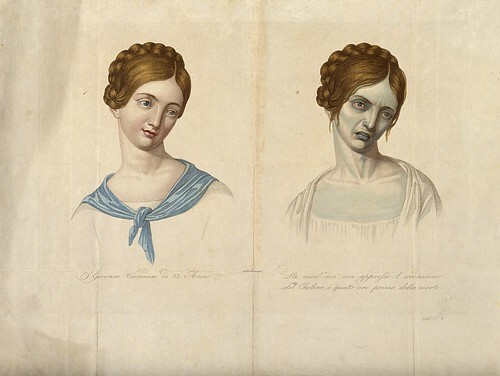 Above: A young Venetian woman, aged 23, depicted before and after contracting cholera. Coloured stipple engraving. Courtesy: Wellcome Collection. Despite being a topic that does not naturally associate itself with beauty, the exhibition is incredibly visually striking: there is a clear progression from section to section and a good mix of media. Videos, specially commissioned artwork, photos and explanatory panels are nicely balanced, giving visitors enough information to appreciate the exhibits without them getting overloaded by facts and figures. Above: Raw Material Washing Hands, 1996, by Bruce Nauman, Video installation. Courtesy ARTIST ROOMS Acquired jointly with the National Galleries of Scotland through The d’Offay Donation with assistance from the National Heritage Memorial Fund and the Art Fund 2008. The strongest area by far is the one focusing on the Deutsche Hygiene Museum, which covers everything from 1960s animations showing the viewer how important washing fruit is (‘be like Snow White and wash your fruit before you eat it!’) to the disquieting ‘racial hygiene’ Nazi posters, and an illustration in Der Stürmer [The Attacker] from 1943 showing the Star of David and the Soviet hammer and sickle as ‘germs’ and ‘microbes’ in the view of a microscope. It also shows promotional posters for, and images from the first international Hygiene exhibition in Dresden in 1911, including Franz von Stuck’s giant eye poster (top). Above: King’s Cross, London: the Great Dust-Heap, next to Battle Bridge and the Smallpox Hospital. 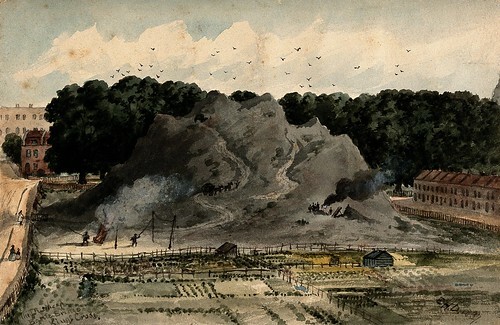 Watercolour painting by E. H. Dixon, 1837. Courtesy Wellcome Library, London. ‘Dirt’ may not be the ideal choice for the more squeamish – the scratch-and-sniff cards accompanied by anti-bacterial hand wash and giant ‘anthropometric modules’ (bricks) made of human faeces were a little nauseating. 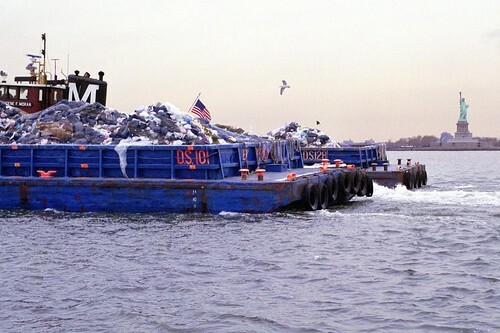 But it certainly is a fascinating insight into mankind’s morbid relationship with waste. Rosie Walters is a UCL student and science editor of Pi. Eye is the world’s most beautiful and collectable graphic design journal. Available from all good design bookshops and online at the Eye shop, where you can buy subscriptions, back issues and single copies of the latest issue. Eye 79, a type special, will be out any moment. This entry was posted in Contemporary Photography and tagged Ant Eggs, Anthropologist, Antonie, Bruce Nauman, Contemporary Photography, Fresh Garbage, Fresh Kills, Information Design, London Exhibition, Maggots, Many Different Types, Microscopes, Photographer, Photographers, Photographs, Photography., Political Attitudes, Posters, Raw Material, Reviews, Rosie Walters, Science Communication, Slums, Stipple Engraving, Venetian Woman, Video Installation, Visual Culture, Washing Hands, Wellcome Collection, Wellcome Library on April 1, 2011 by Eye contributor. 1. Picture Books is A F.L.O.A.T collaboration with four Independent Photography Book publishers featuring selections from Hassla, JSBJ, Lay Flat and Seems. Opening Reception and book sale, introducing a selection of limited edition prints TOMORROW December 18th 6 – 8pm. Don’t miss this event! 2. EBERSMOORE in Chicago is excited to announce its upcoming exhibition, Ah, Wilderness!, a curated artist book of 50 plus artists. Including work by Heidi Norton. 3. Take a break from holiday madness to read Artie Vierkant’s treatise on the post-internet image object over at jstchillin. If this is Artie chillin‘, you better step up your game! 5. Daniel Shea has extended viewing hours for Lesson 1: Misanthropy New Sculptures, Photographs, and Video Work by Daniel Shea at Acre Projects *ADDED HOURS: Dec 17th, 6:00-9:00. 6. TONIGHT in Brooklyn, PhotoFeast’s slideshow exhibition is a one night event featuring photography, video, installation, performance and a zine library by students and emerging artists in New York. 8. The Magenta Foundation is pleased to announce Year Seven of its Emerging Photographers exchange! Deadline for submissions is Friday, Dec 31. Click here for “Guidelines for Submission”. This entry was posted in Contemporary Photography, Uncategorized and tagged Ah Wilderness, Artist Book, Book Publishers, Chillin, Contemporary Photography, Daniel Shea, Emerging Artists, Featuring Photography, Gallery Artists, Holiday Madness, Image Object, Independent Photography, Internet Image, Lesson 1, Limited Edition Prints, Magenta Foundation, Photographer, Photographers, Photographs, Photography Book, Photography., Picture Books, Video Installation, Video Work on December 17, 2010 by [email protected] (Kate Steciw). This entry was posted in Contemporary Photography and tagged Abramovic, Android, BjöRk, collection, Deichtorhallen Hamburg, Doug Aitken, Encyclopedia, Exhibition, Hein, Isaac Julien, Monica Bonvicini, Photography., Rist, Seo, Thomas Demand, Tony Oursler, Video Installation, Wallpapers on December 13, 2010 by .